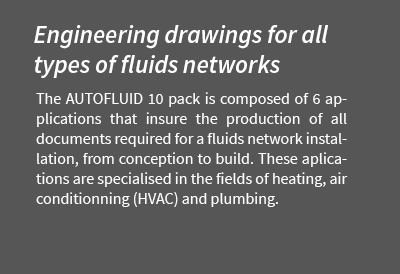 AUTOFLUID is the CAD package of choice for professionals in the fields of HVAC, sanitary, medical and industrial fluids. AUTOFLUID is widely adopted throughout the profession, from international firms to independent offices. Our users have made us the leader in France. The suite is composed of 6 applications that were created by usersfor users to save you precious time. We’re experts in the field of engineering for fluids and we're doing our best to develop the simplest and the most pragmatic tools. With AUTOFLUID you can configure, draw and dress technical drawings in just a few mouse clicks. An exhaustive gallery of graphical components insure the highest level of precision and graphic quality. Plans created with AUTOFLUID are always clear, reliable and produced in the shortest time. AUTOFLUID offers a reliable and efficient solution for engineering practices in the fields of HVAC and fluids looking to collaborate on BIM projects. AUTOBIM3D transforms your 2D network plans into 3D models, ready to be used in all your BIM project. 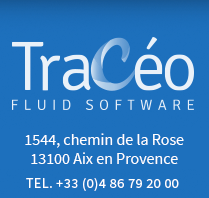 To get started in the best possible way or to improve existing knowledge, Tracéocad offers beginner and expert training for each application. With this augmented version of AUTOBIM3D networks can be exported in .IFC file format. This insures that all the data related to your drawing is embedded in the file. Your drawings remain accurate, compatible and editable with all common BIM packages on the market. Further into the future, Tracéocad is planning the release of an update that will allow users to export in .RVT, Revit’s native format.